Groups of up to ten people cruise the Mentawais in comfort on board Barrenjoey, a sturdy sail and motor cruiser fully set up for surf charter holidays. Owned by John & Belinda McGroder; John is one of the most longest serving and experienced of Mentawais skippers who guides trips around the Mentawai islands and further north, seeking out the best breaks available. One of the larger boats in the Mentawais, Barrenjoey has a long range and opens up a big range of surfing possibilities. See the Mentawais Surf page for more about the epic surf in this remote region. Barrenjoey is a 70ft ketch-rigged, steel motor-sailor, built to Lloyds of London specifications. Accommodation, all air-conditioned, is in two, private double cabins, plus a larger six-bunk cabin with its own TV and DVD player. Facilities include hot and cold fresh water shower, and an additional shower outside. The spacious, cool, air-conditioned saloon seats eight people and has a comprehensive library, TV, video, DVD, and a drinks fridge at hand. Holiday charter packages include a healthy selection of tasty Asian and Western meals, snacks, 30 cases of beer, soft drinks and bottled water. (If you have any special dietary needs, please inform us beforehand so that we can cater accordingly.) The boat has a full range of snorkelling and fishing equipment for the use of our guests. All clients are met personally at Padang Airport and transported by private van directly to the boat. 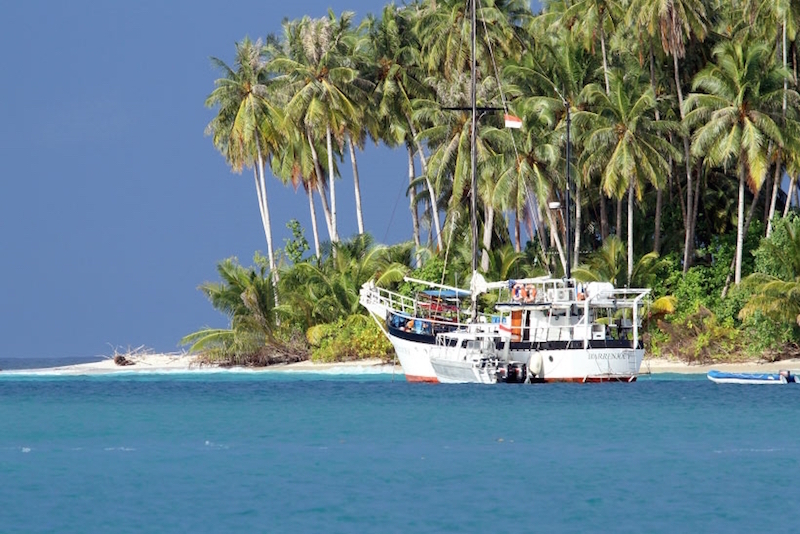 Most holiday trips go first to islands in the Mentawai group, then set the itinerary from there depending on the conditions, the wishes of the group and the advice of the skipper, who has extensive experience with the currents, swells, tides and winds. At the end of the trip, clients are transferred directly from the boat to the airport. Atoll Travel holiday packages on Barrenjoey include airfares with Garuda Airlines, all transfers, 11 nights accommodation on board, all meals, surf guide, fishing gear, snorkeling and other activities, harbor clearances and permits.